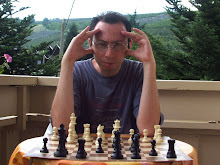 He has been the world most rated chess player for about two decades. Now Garry Kasparov has entered the list of the 100 most influential people in the world, compiled by “Time” magazine once a year. “The Time 100 is not a hot list. It's a survey not of the most powerful or the most popular, but of the most influential”, explains Editor Richard Stengel. “We look for people whose ideas, whose example, whose talent, whose discoveries transform the world we live in. […] Like the great chess master Garry Kasparov, who is leading a lonely fight for greater democracy in Russia”. The Time has split “people making a difference” into five categories: Artists & Entertainers, Leaders & Revolutionaries, Heroes & Pioneers, Scientists & Thinkers and Builders & Titans. Garry is listed amid Heroes & Pioneers. Here is what Michael Elliott writes about the former world chess champion: “Garry Kasparov likes to say he has been in politics all his life. In the Soviet Union, the nation in which he grew up, chess was a way of demonstrating the superiority of communism over the decadent West, and a chess prodigy was inevitably a political figure. 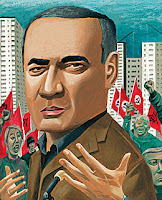 Kasparov never dodged that fate; when he took on and eventually defeated Anatoly Karpov, the darling of the Soviet chess establishment, in 1985, his image as a prominent outsider—Kasparov is half Jewish, half Armenian—was fixed. Kasparov's status has been maintained in post-Soviet Russia. His organization, the Other Russia, a coalition of those opposed to the rule of President Vladimir Putin, has held a series of demonstrations, often broken up by the police. For Kasparov, Russia today, dominated by a combination of huge energy enterprises and former security apparatchiks (such as Putin), is a betrayal of those who dreamed of democracy in the early 1990s. Putin's foes are fragmented and run from old-fashioned nationalists to modern liberals; Kasparov, 44, insists he is just a moderator, not a leader, of the movement. But by giving a voice to those who believe that Russia can develop in a way different from the authoritarianism that seems always to have been its fate, the retired grand master shows that he has not yet made his last move”. If you want to know who is in the Time top 100, just click on the following address: http://www.time.com/time/specials/2007/time100. Coming back to “real” chess, today a rapid match between Vladimir Kramnik - Garry’s ex-pupil :-) -, and Levon Aronian has started in Yerevan, Armenia. Vlad had White in the first game, which he won in a very convincing and brilliant way; Levon immediately took his revenge, leaving things level at the end of the day. The match consists of a total of six games and will finish on Sunday. The time control is 25 minutes for the whole game with an increment of 10 seconds per move. Official site: http://www.aroniankramnik2007.am/. 1. e4 e5 2. Nf3 Nc6 3. Bb5 a6 4. Ba4 Nf6 5. O-O Be7 6. Re1 b5 7. Bb3 O-O 8. c3 d5 9. exd5 Nxd5 10. Nxe5 Nxe5 11. Rxe5 c6 12. d4 Bd6 13. Re1 Qh4 14. g3 Qh3 15. Be3 Bg4 16. Qd3 Rae8 17. Nd2 Re6 18. Qf1 Qh5 19. f3! I can’t believe this natural move is a novelty, and actually it isn’t :-): at least it was played in an E-mail game, Segovia Becker-Henao, 1995. In the above mentioned game Black preferred 19...Rf6, but White got a clear advantage after 20. Bd1 Re8 21. Bf4 Rxe1 22. Qxe1 Re6 23. Be5! Bxe5? 24. dxe5 Bf5 25. f4 Qg6 26. Qf2. 20. Qf2 Nd5 21. fxg4 Qxg4 22. Qf3 Qg5 23. Rxe6 fxe6 24. Ne4 Qg6 25. Qe2 Nf4 26. Qc2 Nh3+? A bad mistake. 26...Be7 would have been safer, but perhaps Aronian didn’t want to play passively. The only way to save the piece. After 27…Bxg3!? 28. Nxg3! Rf2+ 29. Qxf2 Nxf2 30. Kxf2 White would have had a big advantage. Black is losing a pawn anyway. 30. gxf4 Qxb3 31. axb3 Bxf4 32. Rxa6 Rc8 33. Nc5 Kf7 34. Nd3 g5?! Aronian doesn’t want to prolong his agony. 34…Bb8 was a bit better. Black could have resigned after this move.